Aviation, in the poem by Royal Canadian Air Force Pilot John Gillespie, has enabled mankind to touch the face of God. For 100 years, The Boeing Company has supplied the innovation and machines to enable us to do so. For most of its first 100 years, Boeing has been tightly woven into Canada’s narrative. On March 3, 1919, William “Bill” Boeing climbed into the rear seat of a company built C-700 airplane behind pilot Eddie Hubbard in Vancouver to fly to Seattle and complete the first international airmail service to reach the United States. Philip Johnson, a Boeing executive, would become vice-president of operations at Trans Canada Airlines, later to become Air Canada. Johnson left TCA in 1939 to return to Seattle as president of Boeing. Today, Canada is one of the largest international supplier networks for Boeing worldwide, including more than 560 suppliers and 2,000 Boeing employees in 12 locations, coast-to-coast. “Canada has the second largest group of Boeing-badged folks outside of the United States,” Jim Barnes, Boeing defence, space and security business development director for Canada told Wings from his office in Ottawa. Approximately 1,400 employees – 80 per cent of the Canadian workforce – are based in Winnipeg, at Boeing’s commercial composite centre of excellence. Winnipeg’s only customer is Boeing Commercial Airplanes in Seattle and Charleston, S.C., where it supplies complex composite part for the complete 700 series of aircraft, including the one-piece composite acoustic inner barrel on the engine nacelle inlet for the 737 MAX, which will help to reduce the operational noise of the airplane by up to 40 per cent. The Winnipeg plant is one of the largest composites plants in North America, but size and pedigree are not guarantees of a share of every airplane line that Boeing produces. “Boeing Winnipeg must to compete for every contract,” Barnes points out. “And it’s tough. Canada has very qualified suppliers and we have long standing relationships with them. Because once we find a good supplier anywhere in the world – and Canada has a lot to offer – they become part of our global supply chain, which includes thousands and thousands of jets worldwide with a tremendous order backlog.” That backlog currently stands at 5,700 jets. 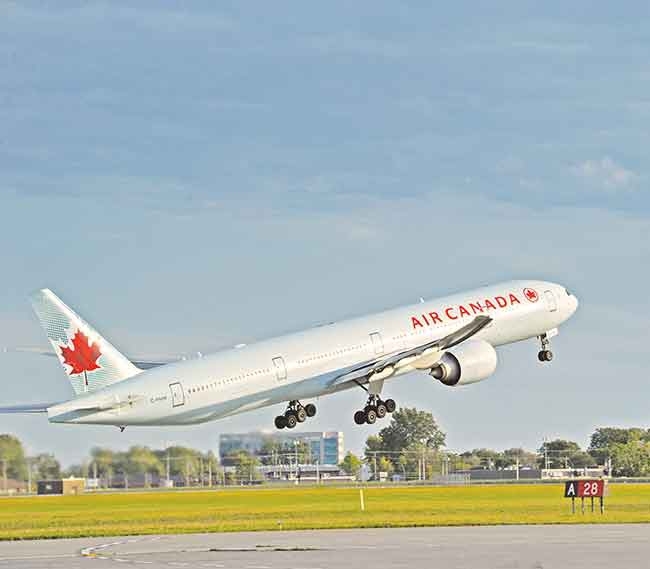 Today, there are more than 260 Boeing jetliners in service in Canada, carrying more than 80,000 passengers a day on approximately 620 flights. These include everything from vintage 737-200s, still operating from gravel airstrips at many of Canada’s concrete-challenged northern airports, to the 787 pushing deep across the Pacific and into the Middle East and India, opening new non-stop services in key markets. On the military fixed wing side, C-17 Globemasters provide the Royal Canadian Air Force (RCAF) with essential heavy-lift capability, while the (former McDonnell Douglas) CF-18 Hornet continues to defend the skies. For rotary, the versatile CH-147 Chinook is now a fixture in the RCAF fleet. And when a replacement for the modernized, but aging Hornet is announced, the contract could go to Boeing. There appear to be two immediate business opportunities on the Canadian horizon: a potential WestJet order for the Boeing 787, and a replacement aircraft for the CF-18, after the current government appears to be shifting course away from the Lockheed Martin F-35 Joint Strike Fighter (JSF). Before moving to Ottawa, Barnes had managed the Canada, Malaysia and Japan Super Hornet campaigns. Boeing has satisfied $8.6 billion (US$6.7 billion) of the $12.7 billion (US$9.6 billion) in agreed industry offsets for previous defence procurements, including $960 million (US$749 million) in spin-offs for the original order for four C-17 Globemaster III aircraft, one year ahead of schedule. Sixty-one companies, including small- and medium-sized operations shared in work packages in aerospace manufacturing, research and development, engineering software and training systems on the Globemaster program. “From a capability perspective, the Super Hornet is one of the most advanced combat proven fighters that are out on the market today. The U.S. Navy will be flying that platform variant until 2040 and beyond. As part of that, they are going to continually upgrade the Super Hornet to stay steps ahead of the threat as it evolves. You don’t know what that threat is going to be so you have to have room for growth, which we do. It was one of the 900 lessons we learned from the legacy,” Barnes says. One of the advance sensor features that Barnes highlighted is the active electronically scanned array (AESA) radar. AESA radar allows a pilot to detect, track and destroy multiple enemy aircraft at significantly longer ranges. In 2000, Boeing provided the United States Air Force with the world’s first operational fighter jets with the advanced-technology radar system on three refitted F-15C aircraft. “AESA has many combat hours on it so it is a proven concept that has already been integrated into the aircraft. Integrating a sensor as advanced as that takes a lot of effort,” Barnes adds. The campaign to replace the CF-18 fleet has heated up, with full-page ads spilling over into national newspapers. Australia, and early customer for the F-35, has also bought 24 Super Hornets “off the shelf” in part over concerns about F-35 delivery schedules. The Royal Australian Air Force (RAAF) expects to operate the Super Hornets beyond 2040, but may be replacing the aircraft with the F-35 around 2030. Canada could take a similar track. “The F-35 is not a replacement for the Super Hornet [with the U.S. Navy.] It is a complimentary aircraft,” Barnes said. “It is going to replace the legacy Hornets on the deck. For almost 60 years, Boeing has defined the commercial jet market by using technological leaps to stay ahead of the competition, beginning with the world-beating 707. In the 1950s and 1960s, the 707 and 727 medium-range tri-jet would virtually render a new generation of propeller-driven aircraft obsolete overnight. (On March 4, the first 727 ever built made its final flight from Everett, Wash. to the Seattle Museum of Flight. The aircraft, resplendent in its original United Airlines colours took 25 years to restore). Boeing bet the company on developing the 747, pioneering the era of mass transport. The company put rival Airbus on its back foot by launching the clean-sheet, best-selling 777 rather than, as expected, re-engineering and stretching the 767, further cementing Boeing’s dominance in the twin-aisle category. But while Boeing’s fleet of 10,000 airplanes account for half of the world’s jetliners in service, the company has stumbled slightly in the bread and butter single-aisle category. Airbus’ re-engined A320neo family is outpacing the 737 MAX series, especially at the larger end of the market, where the A321neo is outselling the 737 MAX 9 by a margin of three to one. Boeing counters that the MAX 8 is better positioned than Airbus in the 165-seat market, an industry sweet spot accounting for approximately 70 per cent of demand. Boeing is already considering scrapping the smallest member of the MAX family, the 126-seat MAX 7. The company is also under pressure to step-up from the MAX 9 and re-enter the midsize or so-called middle-of-the-market (MoM), which was left behind in 2006 when it discontinued production of the high-cost 757, in response to a market that appeared to be tacking between larger long range aircraft, or smaller airplanes. For Boeing, the choice would appear to be between “MAX 10” – a further stretch of the 737 design – to compete directly against the larger A321neo, or a launch of the 797, a clean-sheet design that would not likely enter airline service before 2022. Development costs would be substantial at a time when Boeing already has a lot on its plate including bringing the 737 MAX to market in 2017, developing the larger, but shorter range 787-10 and expanding the 777 product line. A decision on whether to green light a new airplane is expected by the end of the year. While the CF-18 replacement dominates the current landscape, Boeing has identified other emerging requirements in Canada including Maritime Surveillance Aircraft such as the P-8, a derivative of the 737-800, and unmanned aerial vehicles (UAV) such as the Insitu RQ-21 Blackjack, built as a small tactical aircraft for the United States Navy. “We’re looking at unmanned vehicles integrated to manned airspace. There are strong military responsibilities, but also commercial activities as well. It can help out with pipeline surveillance. These are the things we are working on in defense that will have commercial applications. Everybody gets concerned when you take a pilot out of the loop. But the redundancy built into these aircraft is maturing greatly. It will be interesting in the future to see the number of unmanned aircraft,” Barnes said. That’s the story of Boeing – a great airplane builder, outstanding technology company and world changer. Barnes, who has a picture of Bill Boeing looking over his shoulder in his Ottawa office, was employed by McDonnell Douglas in 1997 when Boeing merged with its long-time rival to create the world’s largest integrated aerospace company. He was immediately absorbed by the company history. “What impressed me most is what has lived within the company DNA from day one with Bill Boeing,” Barnes says. He tells the story of how Boeing, a timber merchant, caught the aviation bug. It was January 1910, when the founder of the airplane giant that would bear his name was one of 20,000 spectators each day that crowded into the viewing stands outside of Los Angeles to take part in the first real air show to be held in the United States. Topping the bill at the 11-day spectacle were Glenn Curtiss, the father of naval aviation, and French aviator Louis Paulhan with his famous Farman biplane. “An air show in those days was a huge deal,” Barnes points out. “It wasn’t as impressive as today with jet fighters doing loops and rolls; it was just airplanes flying by with people in their Sunday best.” But 29-year old Boeing was a restless spectator. He wanted to fly. An attempt to catch a ride in Paulhan’s Farman was unsuccessful. Boeing would get to fly four years later, on July 4, 1914, when Terah Maroney, a pilot, gave Boeing and Conrad Westervelt, a lieutenant in the U.S. Navy, a flight on his Curtiss floatplane. Later, Boeing would tell Westervelt, “there isn’t much to that machine of Maroney’s. I think we could build a better one.” They did: the B & W Seaplane, completed in June 2016. The pair would build two before going their separate ways. The aircraft would set the course for Boeing the man, and Boeing the company.